Technical production and solutions specialist Solid Rock Event Technical working for Blue Platinum Events, provided the full technical production – lighting, sound and large format video projection – for a massive son et lumière at the FNB Stadium in Johannesburg, part of a special invitation two location event for the key sales teams, dealers and clients of Daimler Truck & Buses, a division of Mercedes-Benz South Africa (MBSA). 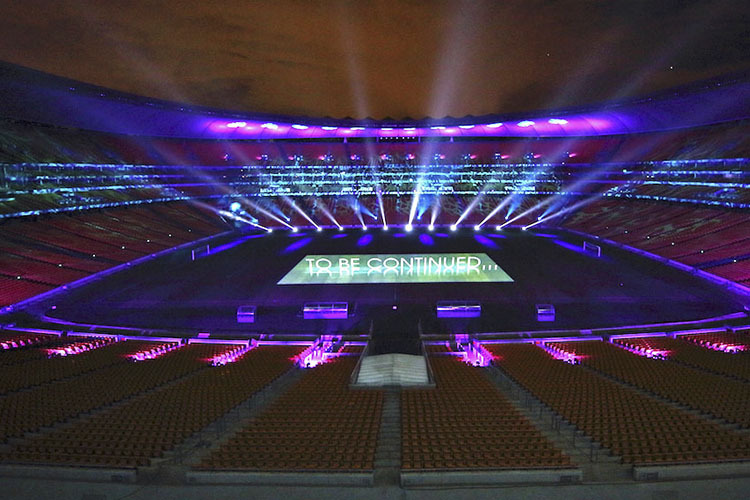 Twenty-four Robe BMFL Spot moving lights were on the lighting spec for filling the voluminous environs of the 95,000 capacity venue – formally known as Soccer City – with lumens, as part of “The Greatest Show on Earth”. 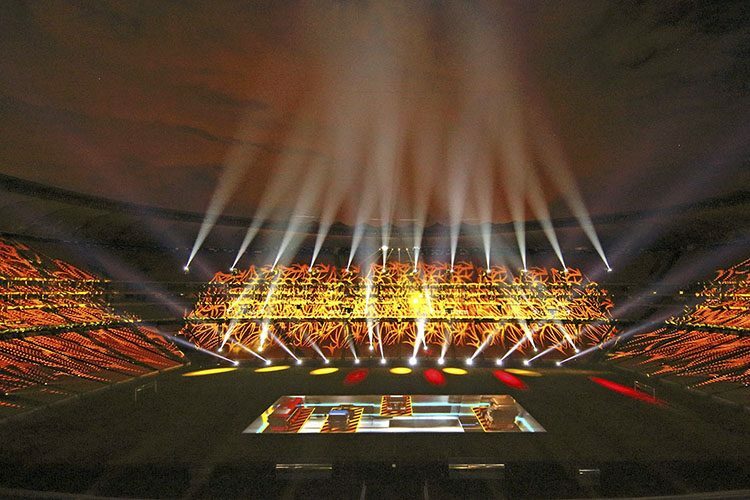 The performance was a complete immersive audio visual experience with high-powered projections mapped to the large pitch area supported by lights shooting around the entire building, spectacular pyrotechnics and a skydiving display team … presenting multiple WOW factors. This was unleashed on guests who were helicoptered in to the ‘secret’ location from nearby Midland. The idea to stage this extravaganza as the entertainment segment of the event was originated by Solid Rock’s Keith MacIntyre, and the BMFLs were already on the lighting spec which was compiled by Keith, when Kurt de Preez of Pan Tilt was asked on-board as the lighting designer. The BMFL Spot fixtures were chosen for the incredible brightness produced by the 1700W lightsource and optimised optical system. 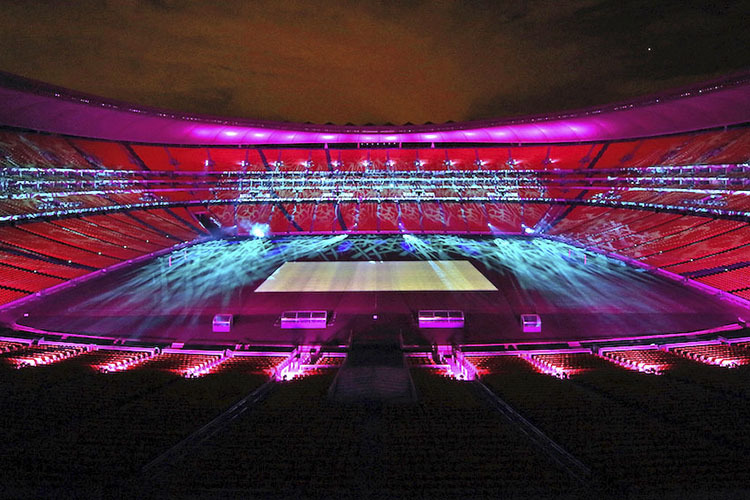 This fixture was built with stadiums and large arenas in mind … and they didn’t disappoint. The units were positioned along the floor of each layer of tiered seating in groups of 4s, 6s and 8s. 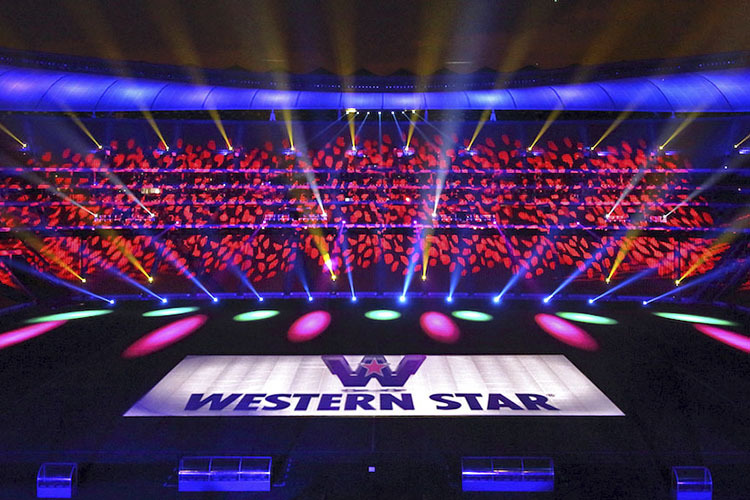 The beams effortlessly threw big fat beams of light right across the stadium to the opposite sides – even with darker colours and gobos in the light-patch, they still blasted through to everyone’s amazement standing out massively from the rest of the fixtures. Twenty-four Robe Pointes also made an impact, located right up at the top of the stadium seating stands, their beams cutting through the blackness to the floor. Kurt had used BMFLs before, but not as many or in a space this large or challenging as this, a place where lumens are voraciously consumed by the darkness – but not the BMFLs! “The BMFL is awesome – for its light weight, sheer output, flexible zoom, incredible speed. No other fixture comes close,” he concluded. Kurt controlled the BMFLs and other lights using his own M6 console.